The scenic drive to Port Douglas is an experience in itself, winding along the coastline, you will get an appreciation of the diverse environments here in the North. To one side you have the rugged mountains and to the other miles of beautiful,secluded coastline with golden sand and crystal clear waters, all this just 50 metres to each side. Once in Port Douglas, there is plenty to do and see, the local markets on Sundays, with locals selling all sorts of things from coconuts to tropical clothing and souvenirs. You will also find the Sheraton Mirage Resort nestled in the lush environment, with beautifully landscaped pools which extend right to your balcony. The famous Four Mile beach attracts many visitors with its natural beauty. on the road to Port Dougas. This beautiful unspoilt beach at Port Douglas is a classic example of the beaches in the area, with seemingly endless coastline of golden sands and palm trees. 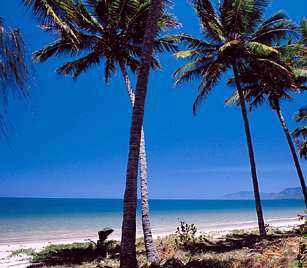 Just minutes from the heart of Port Douglas the beach offers uninterrupted views to the ocean which is iconic of the beaches within the region. The Port Douglas markets are open every Sunday with a large choice of fresh local produce, gifts, arts & crafts along with souvenirs of the region. The markets are not a large as the Kuranda markets but a worth a look at if you are passing through the region. 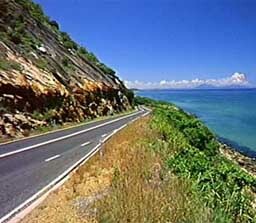 From the markets you can overlook the coastline and take in the atmosphere that is Port Douglas. 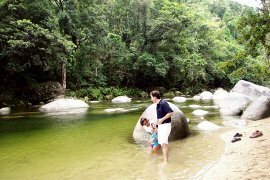 This beautiful and refreshing swimming hole is a favourite amongst locals and visitors. Nestled in the rainforest, with easily accessible walks, this is one of many swimming holes hidden deep in the forests, away from the cares of the modern world. Enjoy a relaxing swim or just get your feet wet. Nestled amongst the rainforest, this Internationally renowned resort blends invisibly within the environment. The preferred destination of movie stars and heads of state. This beautifully designed resort provides a real sense of tranquility and opulence. Backing onto the resort is the beach for guests to take in the early morning sun,..
You will love how natural your wedding photos look and how stunning they are in your custom designed Magazine styled album. Posh Photography are exclusive photographers in Cairns and Port Douglas. Their photographic style and leading Magazine Albums are perfect for couples who want something different. Lucia Ormonde is a Civil Marriage Celebrant for Australian Weddings in Yungaburra and Cairns. She has performed wedding ceremonies for couples from all over the world in a range of diverse locations, including romantic rainforest rituals, formal celebrity ceremonies on the beautiful tropical coastal islands and peaceful garden weddings in the Cairns region. Lucia's repertoire of wedding ceremonies range from appropriate simple ceremonies to sincere, romantic rituals that reflect the true spiritual integrity of marriage. Lucia will work with you to compose a personally relevant ceremony that captures your history and highlights as a couple working together in relationship. Make your wedding a special day by asking Lucia to design your very own personal, heartfelt marriage ceremony. Nestled amongst the rainforest, this Internationally renowned resort blends invisibly within the environment. The preferred destination of movie stars and heads of state. This beautifully designed resort provides a real sense of tranquility and opulence. Backing onto the resort is the beach for guests to take in the early morning sun, or for honeymooners to romantically watch the crimson sun disappear into the depths of the Pacific Ocean.